Executive remuneration is increasingly perceived by stakeholders as a window into how the board sets the strategy and how it motivates management. The say-on-pay votes have thus assumed greater importance. Remuneration policies and practices are required to be in line with the business strategy and not encourage risk-taking. The engagement between companies and investors is still a key driver for the development of sustainable remuneration practices and long-term value creation. For companies belonging to the S&P 500, support levels in 2017 remained consistent with 2016 – 91.8 per cent average in 2017 (v. 91.4 per cent in 2016) and a median of 95.2 per cent in 2017 (v. 95.3 per cent in 2016). Pay for performance misalignment, magnitude of pay and ‘rigour’ of performance goals (i.e. how the compensation committee sets performance targets) under incentive schemes are the predominant themes for adverse proxy advisory firm vote recommendations and low support on 2017 say-on-pay. A total of 449 proposals had been voted up to 31 July 2017 and only four proposals failed (0.9 per cent in total). While the average support level on the proposals that passed was 91.8 per cent, the median was notably higher at 95.2 per cent. Comprehensive disclosure on shareholder outreach, engagement discussions, actions taken (or to be taken) in response to ‘low support’ are expected to avoid potential negative vote recommendations against compensation committee members. If the issue persists, the full board may be held accountable. With the exception of blind followers of ISS and Glass Lewis, institutional voting on say-on-pay is usually case-by-case. Early planning, year-round engagement to foster relationships with shareholders whose support may be needed in the future, comprehensive disclosure and effective communication of a company’s business strategy and its link to executive compensation and corresponding pay decisions are essential in garnering support. Historically, proposals on incentive plans typically have not received the same level of attention, scrutiny or opposition as say-on-pay proposals – and that continued to hold true in 2017. A total of 120 proposals have been voted upon through to 31 July 2017. 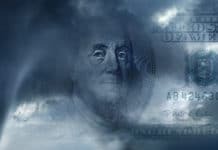 Proxy advisory firm evaluations and vote recommendations are driven primarily by the size of the new share request and associated cost to shareholders, along with a company’s three-year average burn rate. Despite ISS adopting the Equity Plan Scorecard model beginning with the 2015 proxy season in an attempt to make the evaluation process more ‘holistic’ (i.e. take plan features and grant practices into consideration in addition to cost and burn rate), the primary driver for negative vote recommendations continues to be predominantly based on the shareholder value transfer cost and three-year historical share utilisation rate. Companies typically engage with shareholders on use of equity in the context of executive compensation and say-on-pay rather than exclusively on a company’s equity plan. In Australia, the ‘two-strikes’ rule was introduced in 2011 to increase directors’ accountability beyond executive pay. The entire company board can face re-election (within 90 days) if the remuneration report receives two strikes in a row (at least 25 per cent level of discontent). Among the top 180 Australian listed companies only 12 companies did not exceed the 75 per cent hurdle. The United Kingdom is the highest performing country in which the average level of approval of the remuneration report is 92.9 per cent and reaches the 94.9 per cent threshold in relation to the binding vote on policies (that takes place every three years). In France, as a result of the enforcement of the Sapin 2 Act, an increased level of transparency and explanations from issuers on executive remuneration has been noticed, notably pay-mix, benchmarks and rationale for the choice of the performance metrics driving variable remuneration components. However, this headway on transparency did not lead to a significant improvement in the average ex-post say-on-pay scores at SBF120 companies (average approval of 89.1 per cent v. 88.7 per cent in 2016). We even noticed a reduction of the average approval score at CAC40 companies compared to 2016. 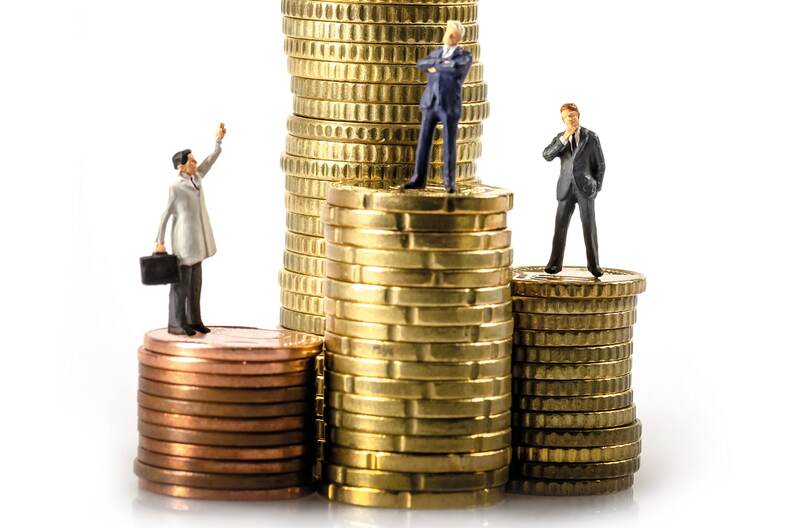 Indeed, proxy advisors and institutional investors have taken stricter stances on executive remuneration packages, placing greater focus on pay for performance alignment. In the opposite direction, there is an increasing trend in the average scores of equity incentive schemes (authorisations to issue stock-options and performance shares). This development is likely due to greater transparency from issuers on the performance conditions tied to the equity awards in response to institutional investors and proxy advisors’ requests. While ex-ante disclosure on the performance targets is still scarce, issuers are becoming more explicit on the performance targets tied to past equity awards, or at least on the level of achievement thereof. The 2017 scores also show that proxy advisors and institutional investors’ requirements on post-mandate arrangements in favour of executives are becoming stricter. The higher level of dissent may notably be explained by proxy advisors’ growing scrutiny of the methods used for the computation of rights under defined-benefit pension schemes, and continued concern regarding the performance conditions triggering executives’ entitlements to severance payments, on a ‘no pay for failure’ basis. In Spain this year, the median investor support for remuneration reports across the IBEX 25 is 86 per cent, broadly in line with 2016. LTIs are increasingly better-aligned with international best practice and, therefore, institutional investors and proxy advisors are focussing more on specifics. But issues persist and namely pertain to disclosure on peer group composition for relative (e.g. TSR) metrics, targets and degree of achievement thereof. The implementation of qualitative metrics lead to another common issue related to discretionary power of boards in awarding bonuses. Investors are increasingly placing more attention on targets that are claimed to be ‘sufficiently challenging’. This is especially the case with relative metrics (e.g. TSR), which entail peer groups, normally expecting that there is no vesting/pay out in the case of performance below the median. 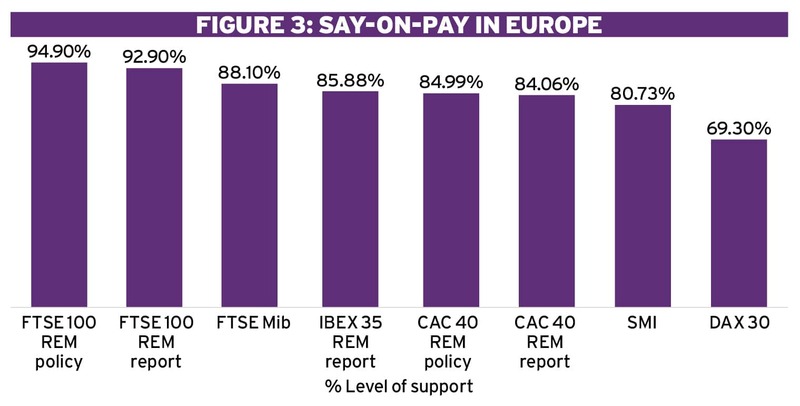 Among the 25 FTSE/ATHEX large cap companies in Greece, say-on-pay still remains relevant only to the very few companies headquartered outside of Greece. Of those having dual listings in the UK and/or Switzerland, we note a slight increase in approval (from 92.5 per cent in 2016 to 98.8 per cent and 99.2 per cent in 2017), suggesting an increased awareness of issuers in aligning their pay for performance practices. Germany is the lowest performing country where there is still no obligation to present the say-on-pay resolution for shareholders’ vote. The average support for those companies that voluntarily submitted the remuneration policy in 2017 was 69 per cent. In Italy the level of support for remuneration policies slightly decreased from 91.5 per cent in 2016 to 88 per cent in 2017. 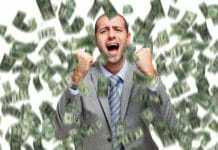 A more in-depth analysis, which refers only to minority shareholders, however, reveals that in 2017, only 70.6 per cent approved remuneration policy reports, while the remaining voters dissented. The major issues identified in 2017 essentially referred to the level of severance payments and the absence of transparency in the definition of the performance metrics for variable incentive plans. The main companies have undertaken structured engagement programmes (with proxy advisors and institutional investors) in order to understand their evaluation metrics to the fullest and to improve alignment with international best practice where needed. The involvement of HR departments in engagement can be now considered a solid practice and contributed to a better understanding of institutional investors on the peculiarities of local compensation practices. While shareholder engagement on compensation resolutions has historically come into play during proxy campaigns only as a result of negative voting recommendations from proxy advisory firms, good disclosure and early communication with top holders should be set as a company’s strategy to demonstrate alignment with long-term shareholder interests and to mitigate future shareholder concerns. 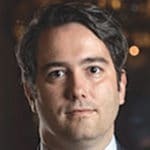 Fabio Bianconi is Director at Morrow Sodali, a global leader in corporate governance consulting, shareholder and bondholder transactions and institutional investor relations. He is focusing on helping companies to enhance communications with their stakeholders and third-party opinion-makers and to analyze their current practices in light of the current corporate governance landscape and their own business developments. Mr. Bianconi also assists companies in designing compensation related proposals and remuneration policies. During his career he has specialized also in capital markets regulation, activism, merger & acquisition, cross-border standard-setting providing expertise in both corporate and shareholder perspectives. Next articleIs cyber risk a D&O risk?